Created the Mobile C++ SDK, which is used in many of Skycatch's mobile, desktop, and web applications. Created the Skycatch Flight App for iOS for controlling DJI drones and uploading drone aerial data to Skycatch's photogrammetry pipeline (see below). Architected and worked on the Skycatch Flight App for Android. Built out the mobile team (interviewing candidates, high level app organization and architecture, distributing and assign JIRA tasks). 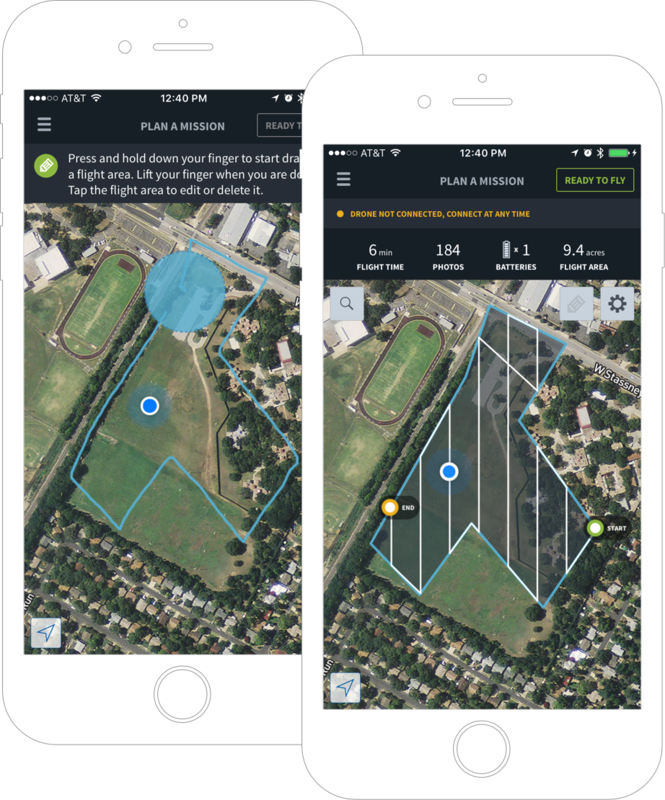 The Skycatch Flight App for iOS allows users to transform their DJI drones into professional aerial mapping tools. With this app users can easily and quickly create high resolution 2D maps & 3D models using Skycatch's cloud-based processing tools. The Skycatch Flight App for iOS was written using the Mobile C++ SDK and shares a significant amount of code with the Android version. Upon entering the app users will see the mission board, which contains each of the sites that are to be flown. Users can easily create new sites to fly or revisit old sites to fly again. Using the mission board, users can simultaneously capture identical data sets each day for multiple sites at a time. To create a flight area, users simply draw in a polygon representing the geographical region they'd like to fly over and collect data from. The drawing algorithm automatically snaps the user's drawn in shape to a polygon and generates the most optimal flight for the drone (the white path in the screenshot). Once the flying area has been specified the user can automatically connect to their DJI drone simply by connecting their phone to the drone's remote controller. From this point the app will take care of uploading the waypoints to fly to the drone and autonomously control the drone's flight (i.e. takeoff, flying to each waypoint, and landing) and data capture. Once the area has been flown and the drone has landed users can drag and drop their images to Skycatch's desktop web uploader. The images are processed using Skycatch's cloud-based processing pipeline and users will receive an email when their 2D/3D photogrammetry has been generated. Below you can see the finished results which include a 2D orthographic map, 3D mesh, and 3D point cloud. Download the Skycatch Flight App for iOS today!